Eggs are considered the” incredible edible” protein and are so versatile. 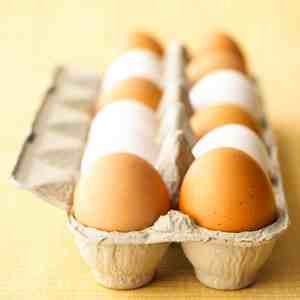 • Select clean, fresh eggs from refrigerated display cases. centered and the air cells stable. Eggs are rich in protein, low in sodium, and high in vitamins and minerals. Boiling is a healthy, easy way to cook eggs. Here is a foolproof technique for for hard-boiling eggs, whether it is just one egg for breakfast or a dozen or deviled eggs to bring to a party or a picnic. 1. 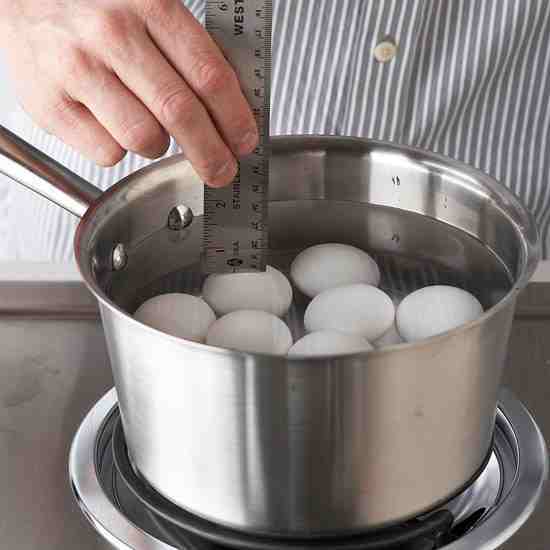 Gently place all the eggs that you intend to cook in a single layer inside a large saucepan so they will cook evenly. Do not stack them. 2. Fill the pan with cool tap water, enough to cover the eggs by an inch or two. 3. 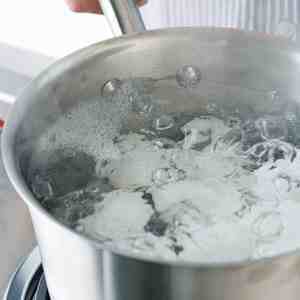 Place the pan on high heat and bring the water to a rapid boil. Water will have large, rapidly breaking bubbles. 4. Once boiling, Immediately remove pan from heat and turn off the heat.Cover the pan with the lid. Let the eggs sit in the hot water for 10 minutes. 5. Drain the eggs, then run cold water over them or place them in a large bowl filled with ice water for a minute or so, until the eggs cool. 6. To peel an egg, gently tap it on the counter to crack the shell. Use your fingers to peel off the shell. Rinse the peeled egg under cold water to remove any remaining bits of shell, and eat immediately.If eggs are not going to be eaten or used immediately, refrigerate the eggs in their shells for up to a week. • If are using the eggs right away, crack the shells gently before putting them in the ice bath. This will help them peel more easily. Drain and rinse the almonds; transfer to a blender. Add the dates, cinnamon, 5 cups of water and 2 pinches of salt to the blender and puree on high speed until very smooth, about 2 minutes. Pour the nut milk through a cheesecloth-lined fine sieve set over a bowl and let drain for 30 minutes. Using a spatula, press on the solids to extract any remaining milk; discard the solids. Transfer the nut milk to an airtight container and refrigerate until chilled, about 30 minutes. Stir or shake before serving. The health benefits of almonds are numerous and well documented in the health an foodie literature. For the most part, they are high in protein, vitamin E, fiber, and minerals such as magnesium, selenium, manganese, zinc, potassium, iron, phosphorus and calcium (commercial almond milks are often fortified with extra calcium). There is even some medical evidence that almond milk helps to lower LDL cholesterol and protect against heart disease. It is relatively low in calories and has zero saturated fats, making it a good choice for maintaining a healthy weight. Almond milk is also great in place of dairy milk in French toast, bread pudding, mashed potatoes, creamy bisques or curries, ice cream (churned), baked goods and, of course, smoothies and “milk shakes”. Almond milk tastes great and adds richness to all sorts of dishes, from the sweet to the savory. On the sweet side, you can find recipes for dairy-free Banana-Almond Milk “Soft Serve” ice cream, using almond milk, frozen bananas, honey and crystallized ginger, all pureed in a food processor. Almond milk can also replace cow milk dishes like rice pudding Desserts such as Almond Rice Pudding, where sushi-rice was cooked risotto-style using almond milk and a bit of sugar. Almonds and cherries are a classic pairing, and topping this recipe pudding with sweet-tart cherry preserves will make you crave it even more. On the savory side, this recipe, Spicy Cauliflower Puree, a vegan dish that is just as good as any mashed potato and will fewer calories, utilizes the simmering of cauliflower in almond milk until soft, then drained and pureed it for a thick, silky mash. This recipe technique so simmering cauliflower also makes a lovely soup if it is s blended with all of the almond milk. Another savory recipe, Almond-Milk Creamed Spinach,the béchamel sauce can be made with almond milk, and folded into the wilted spinach and grated Parmesan cheese, then topped with panko and marcona almonds and baked it until it was bubbling and golden. These are just a few interesting ways to make almond milk a part of your cooking routine. 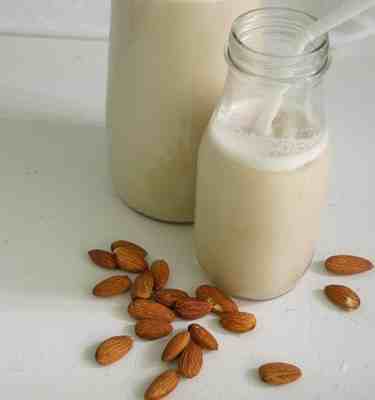 Make sure you check out the post about making home made almond milk. It will be worth you while an a fun project the the kid chef’s in the family.